Halfway through the summer holidays and we seem to have done nothing. Nada. Rien. And you know what? It’s been LOVELY. Actually, we did go out once. The kids got dressed and everything. 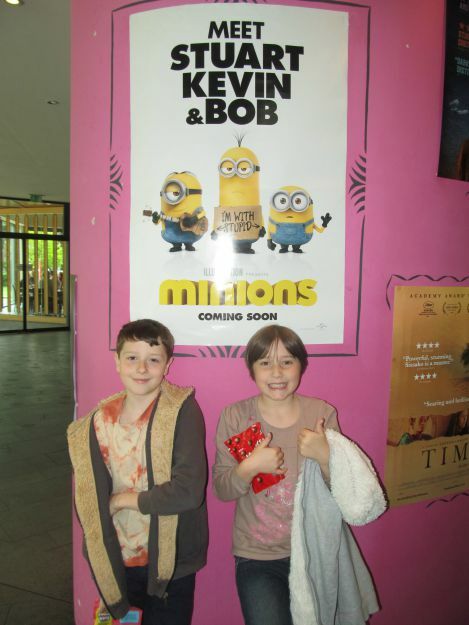 It was due to M’s uber excitement about her birthday treat which was to see Minions at the cinema. Oh yes, and we got a McDonald’s afterwards – yippee. <insert sarcasm> But they had a lovely time and that’s the main thing. I know I am on the lucky end of the autism parent scale. Every morning (unless we really have needed to go out) I get a lie in while the youngest two head downstairs, get a drink and make their own breakfast. They then lounge about in their pyjamas and watch a bit of TV. After half an hour or so, M makes me a cup of tea and B brings it carefully upstairs. I am spoiled, I know, and I am insanely grateful. I’d like to say that they continue being as adorable all day but obviously you’d know that was a lie, and it would be. However, the stress and anxiety levels have plummeted since the school bell rang to signify the end of the year, and it has been wonderful to watch. My biggest challenge was not falling apart when I drove Teen Boy through to Aberdeen in the first stage of his World Scout Jamboree journey to Japan. I am so proud of myself for being able to hug him goodbye without howling, and for continuing to keep cheerful on the rare occasion he has had Wifi (and time) to send a quick Facebook message. To think that five years ago he had had a breakdown due to the pressures of a few days at his (then) new secondary school, and he basically lost 18 months of his life to depression and extreme anxiety (thank you – not – Aspergers), and now he is on the other side of the world having the most amazing time with his Scouting friends shows me just how far he has come. I confess to cyber stalking him through every social media I can use, and I am building up a nice little album of pictures for his return. This is a snap of him on what I think must be the underground system in Tokyo – photo credit to one Andrew Rosam via Twitter. As you can see, he is looking very cheerful. Doncha just love social media? So, this is us. We’re not going away this summer (boo hoo) but frankly we do have a ton to do in the house, not the least of which is sorting through and chucking out loads of outgrown clothes. M has homework from her CAMHS sessions, which is to head out into the garden by herself for short timed periods and this is going pretty well. She needs a diversion, like the trampoline, or bubble blowing, but even back at Easter she wouldn’t have been able to contemplate doing this. I am hoping that B’s on-going assessments will result in an ASD diagnosis, which will give him access to the support he is definitely needing, and I am hoping above all that when they go back to school in three weeks that their new teacher will be an understanding sort who rises to the challenge of getting to know how my beautiful children tick. Off to make another coffee and put yet more washing in the machine! It’s all go here.